The Field Spaniel is a spaniel, a gundog which is used for flushing prey. They search for game birds, which in turn panic when found and appear for the waiting hunter. Once the prey has been shot they will retrieve the birds on command. 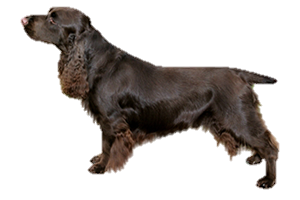 The Field Spaniel was breed in England from the English Cocker Spaniel, originally in an attempt to have a solid colored and slightly larger spaniel, particularly in the show ring. Unfortunately, once designated as its own breed in the 19th century breeders began altering them drastically. Their shape became exaggerated in an attempt to approve it as breeders wanted to produce a long and low show dog. This nearly ruined the breed, giving them a weak, long body, sagging underbelly and crooked legs. Crosses with other breeds were made, including a cross with the Basset Hound, creating further damage and dogs that could no longer be used in the field. Loss of interest and the two World Wars caused the breed to come incredibly close to extinction. In the 1960s the breed was saved by introducing Cocker and English Springer Spaniel crosses and the breed was rebuilt into a working dog, yet even today remains rare, overshadowed by its cousins. The Field Spaniel is currently listed as one of The Kennel Club’s (KC) Vulnerable Native Breeds, with only 55 new registrations in 2010.